with a pace much more rapid than i would prefer, my childhood memories are being usurped by events much more current and much easier to recall. but there are some memories left. 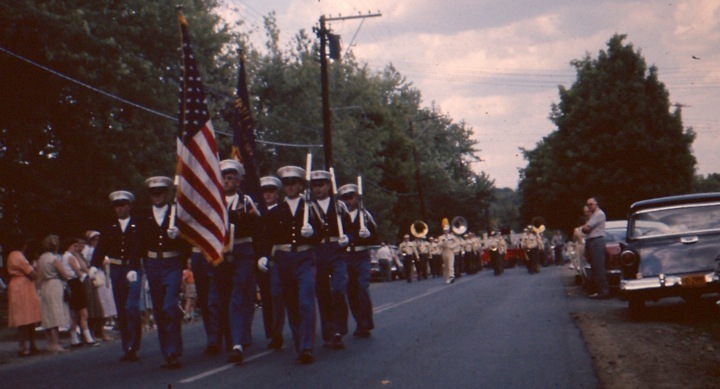 perhaps none more vivid than what stood at one time as the biggest annual doings in the town of ghent — the annual memorial day parade. nothing brought the housewives out from behind their ironing boards (aprons still tied around their waists) and the tom sawyer wannabes away from their trout streams with greater enthusiasm than the metered walk down main street (could it have been an entire mile?) for which my hometown reserved all its enthusiasm. well, this and the reopening every spring of the town’s largest and most appreciated employer: the dairy queen. today, memorial day is the invisible starting line for summer activities in the great northeast. many of us are granted a day off and a season pass to all the picnicking, camping, planting and jarts we can squeeze into the subsequent three months. because we know labor day – the invisible finish line for all things fun – is speeding toward us at a breakneck pace. in my little town, in my elementary school years, in my faded and fading memory, memorial day was a day home from school. it was a day of sunshine and warmth and leaves on the newly planted trees. but most vividly, it was the sound of the year’s grandest event – the parade. and it all came together, in my childhood, in my neighborhood. on my street. every memorial day, shortly after 8:30 in the morning, the first sounds of teen-aged lips pressed to cold trumpets reverberated off the houses on cherry lane. the first warm-up notes from the sleepy brass instruments stung the early morning air and told everyone in the ghent development that they now had less than 30 minutes to find a place to stand along main street. when i was old enough to walk to the end of the driveway by myself, i would sneak a peek up the street to get a glimpse of the shiny brass, the giant sousaphones, the enormous bass drum, and the frightening, crashing cymbals. oh, the cacophony. every instrument seemingly trying to out-scream the next, all in the name of john philip sousa, the chatham high school marching band under the baton of stephen gitto, and the united states of america. those sounds bouncing off of those houses that early in the morning brought excitement, and a lifelong memory, to a young boy’s ears. having the local parade form and subsequently step off right at the end of your street was a privilege and an honor and one i have never taken lightly. never was that more the case than during those four glorious years during which i was one of those lucky kids in the marching band uniform, with the shiny brass trumpet and the screeching warm-up notes echoing off the neighbors’ siding. while all the other band members were driven by their parents to the high school, loaded into a bus, and driven to my street, i had only to walk a few measly paces from my driveway, past the bartholomews’ and havlicks’, and right into the parade line. what took you guys so long? oh, you had to take the bus? not mee-eee. i’m surprised i never got a wedgie. the wide-eyed observer had become a wide-eyed participant. i’m sure, as a smart-aleck teen-ager, i took the experience for granted. i certainly don’t today. today, i leaf through the yellowed photo albums and faded slides, stumbling across parade images taken from the very spot our family would stand every year (in the boland family’s front yard, directly across from the school) to watch as the procession made its way out of the development, turned at the dairy queen, and headed off down the dip in the road past the bartlett house and into the fire house parking lot. today, i pay an all-too-infrequent visit to these old stomping grounds, driving along this vaunted parade route, running the memories through my mind’s view finder as the drum cadence taps out of my fingers and off the steering wheel. today, i stop at the end of my street, in the exact place the memorial day parade took shape, and i take it all in. i notice the houses that once lined the lane are now shrouded behind the trees that seemingly not that long ago were saplings held in place by wire and tent stakes. the true measure of a man’s time on earth is found in how massive the trees have become along the lane where he fell off his first bike. where his heart, every memorial day, gleefully returns. where he can still hear the sounds of a sunny spring morning giving birth to a small-town parade.